So yes. The hole I ground nearly through my fingernail. When you have long nails (or longish ones; mine do not approach the ridiculously unwieldy lengths which seem to denote in the wearer a certain aspiration to lady-of-the-court idleness, which itself suggests some connective link with the phrase "waited on hand and foot"), you tend to use them as tools. 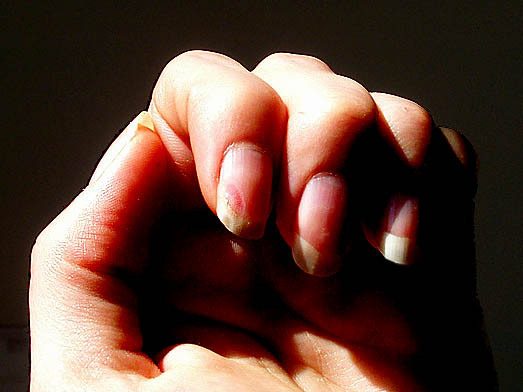 The benefit is that you don't feel any damage that should occur to your nails in the course of your labors. This limitations of this benefit are not to be underestimated. How else would you hold a tiny triangle of glass, 3/8" on a side, for grinding, other than to push with the flats of your nails against the two sides of the triangle not being pressed against the rotating diamond head? I don't know, but clearly my method is not the optimal one. The irony (or the "irony") here is that it's an odd senstation to hold soft unprotected fingertip-flesh against the diamond head while the grinder is on, but it doesn't hurt, and does no damage at all. The ground-away place on my fingernail doesn't quite hurt, exactly. There is a sort of twinge of protest that happens underneath, if I press against the reddest, thinnest part of the gouge (with the tip of another nail, natch). I suppose I'm very lucky I didn't grind all the way through. The gouge is, however, developing a tiny split down its center, which must lengthen infinitesimally each time the nail tip bends or flexes in an impact with the hundreds or thousands of objects and surfaces a finger touches each day. Generally speaking I don't spend much if any time in grooming of my nails (another distinction between me and the lady of the court): they get so long, then they break, and grow some more, all without any aid from me. In this case, however, I think it would be foolish not to go and find the nail clippers already, before the ground-down-fingernail situation goes from creepy and distracting to supremely painful. Ah...I can solve your nail pains! Allow me to introduce you to my little blue friend Nick. www.nicksgrindersmate.com. Best $20 I EVER spent! There are a few tricks to using it, but it really saves nails and holds the little tiny grain of rice sized pieces. It is not available at Warner-Criv, but it is available at several other online retailers. Email me and I can give you the full scoop. Hi JenB! I actually got one of those yesterday. I'm very curious to give it a test drive. Good to hear it holds tiny pieces, too... I wondered about that. I'll be starting a new project on Monday night so I guess we'll see then! 1) when you are done for the day or whatever rinse the glass dust/goo and then squirt the spring with WD 40 so it won't rust. 2) Keep that little blue thing that opens the jaws for storage. I have heard that the pads can smush too much otherwise.